Malacañang must explain fast and satisfactorily the terms and conditions of the government's $62-million loan agreement with China for the Chico River irrigation pump project in the Cordillera region. The opposition has raised some constitutional issues surrounding the loan agreement with China and sought a nullification of the financing arrangement. The high court has just directed Malacañang to answer the petition of leftist lawmakers, who questioned the legality of the loan deal. The petitioners claimed that Philippines stood to lose natural gas deposits in Recto Bank or Reed Bank as collateral in case of a loan default. 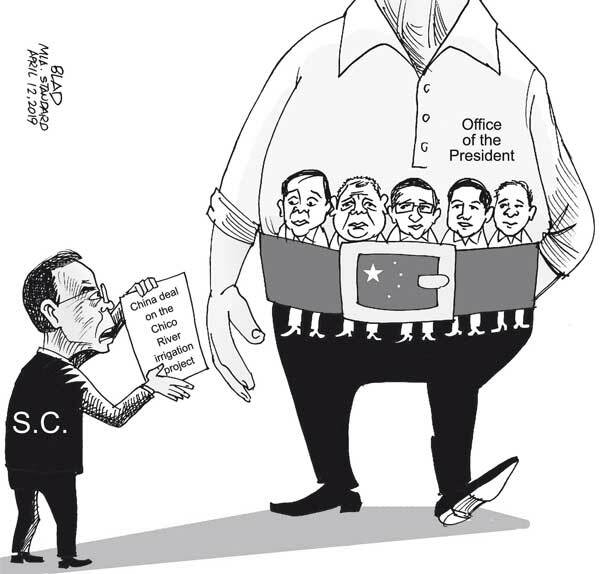 Petitioners argued that the agreement violated several provisions of the 1987 Constitution, citing that the loan agreement contained an express waiver of sovereign immunity over the country’s patrimonial assets in favor of China. The charges at the outset seem credible because of past dealings between China and other nations. The petitioners cited the case of Ecuador, which was forced to grant China control of 80 percent of its oil production after it defaulted on a Chinese loan for its Coca Codo Hydro Dam, and that of Sri Lanka that surrendered to China the control of its Hambantota port, also after failing to pay its loan. The Philippines, of course, has never defaulted on its previous debt agreements with foreign nations and multilateral lending institutions like the World Bank and the International Monetary Fund. At worst, it declared a debt moratorium in 1984 at the height of a foreign exchange crisis that crippled the Philippine economy. That moratorium was a plea for more time to reschedule the payments over a longer period on the promise that the Philippines would restructure the economy to improve its debt repayment capacity. The government, however, must disclose the terms of the Chico River loan deal with China to prove that it did not compromise national sovereignty. It must do so convincingly to validate the economic feasibility of the project, which among other things aims to provide a stable supply of water to around 8,700 hectares of agricultural land, benefit 4,350 farmers and their families and serve 21 barangays in the provinces of Kalinga and Cagayan in Northern Luzon.